At first glance, the MK802 II differentiates with its earlier parent by including a male HDMI connector, protruding from one end. This HDMI connector will allow you to plug the MK802 II directly into your HDMI enabled TV. This might be perceived as a nice change, provided you got enough room on your TV case whereabouts for the MK802 II to fit. It also incorporates two USB ports, a normal sized one, and a micro USB port. A microSD card reader is included too, compatible with up to 32Gb microSD cards. Everything seems just ballpark ok for such a low cost Android Mini PC, right ? Wrong! The maximum output resolution has been capped at 720p, so no full HD output. This is what we assume is the wrong angle on fighting against processor heat. We suspect that the MK802 II is trying to keep it’s processor heat low by lowering the workhorse power required to generate 1080p. We are certain that the MK802 II can be hacked into obtaining full 1080p output, but then things may get hot enough to burn this Android Mini PC out … or not ? 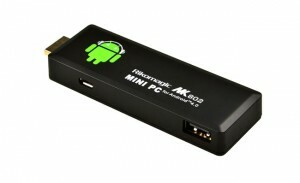 If you got an MK802 II Android Mini PC, share your experience with us!